The art of waiting: The best way to prepare for an appointment with an endometriosis specialist. | The Endo The World? The art of waiting: The best way to prepare for an appointment with an endometriosis specialist. Having endometriosis seems to be an excellent lesson in developing patience. A lot of waiting around seems to be involved with this disease: waiting for medical appointments, waiting to see if a new treatment regime works, waiting to see whether you can have a baby, waiting for adjustments to be put in place at work, etc. I’m still not very skilled in the patience department, waiting is not my forte. It;s makes me jittery and anxious. I don’t think I’ve ever heard to three bleeps of the microwave that tells you it has finished. What can I say, I’m a do-er. The lack of progress in taking control of and managing my disease was really getting to me for a while, but since the new year I have tried to fill the void by being slightly more proactive. It took much foot stamping and pleading, but I finally have an appointment booked in BSGE accredited endometriosis centre at the beginning of March, so that is some progress at least. I’m really excited to finally discuss my situation with an endometriosis expert. The waiting time involved in this has got me thinking about the best way to prepare for such appointments. For some reason, despite being intimately acquainted with the effects of endometriosis on my body, all this information just seems to evaporated out of my head the moment I enter a doctor’s office, and I never really do justice to how unwell I have been. Maybe it’s some weird British stiff upper lip thing. To address this, one thing I have started doing since the new year is keeping a pain and symptoms diary, using the ‘my pain diary app’ for iphones. I thought it might be useful to show my consultant something ‘concrete’ about how the disease affects my life, since my saying ”I am in agony and exhausted most of the time” doesn’t seem to have penetrated the psyches of most doctors I have visited before. I’m quite interested to see whether this approach impacts upon the quality and outcome of my appointment. I will keep you all posted on that! My Pain Diary tracks the symptoms of my endometriosis and their intensity. 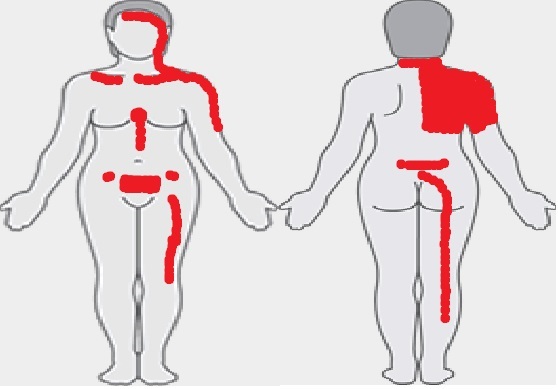 I also made this diagram to show precisely where I experience endometriosis pain, and I am hoping this might be useful in ensuring that each of these areas are addressed in some way by the end of my consultation. My shoulder pain, thanks to the endometriosis on my diaphragm, is particularly debilitating, but so far I haven’t found anything to help with this. So, I would like to know, how do your prepare for meetings with your endometriosis specialist? Do you use any technologies to do this, and do they help? Tips and advice in this area greatly received. 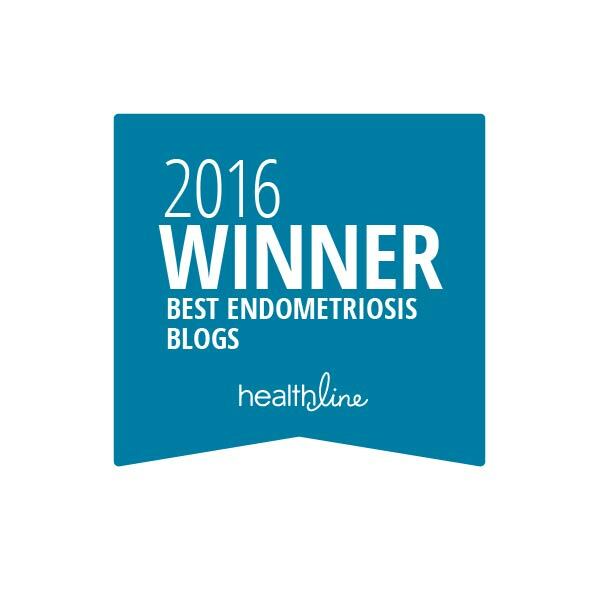 Also, I’d like to hear your thought on coping with the waiting and uncertainty that comes with endometriosis. ← Endo, Me, and a PhD: The challenges of working and studying with a chronic illness. A great topic. It happened to me too. I assumed the worst as ‘normal’ and kept telling my doctors his much better I was! Total face palm. I couldn’t quite get across my pain, tiredness, frustration. So I wrote a list of EVERYTHING, printed it, and handed it to my GP. She got the message. Oooh I do love a list. Thanks for that tip- I am definitely going to give that a go as well. Happy New Year! Hope you had a lovely Christmas. When I am seeing a new Doctor, I generally type up a summary and timeline of my symptoms, surgeries etc and take it with me. Even better is to phone the clinic and ask them for an email address and send it through in advance for the doctor to read prior to your appointment. This is because they are sometimes not very impressed if you turn up with a comprehensive summary which they then have to read in front of you, and when you think about it, it’s also a waste of the precious short time you have with them that you’re paying for which you could be spending talking and asking questions instead of watching them read. I’ve found that if sent beforehand, they will usually print it out and underline or write notes on it to ask you about specific points. This is how I was told that I probably had Endo, because he just sat there and read my summary, asked me a couple of questions and then sat there and said “You almost definitely have severe Endometriosis”, so I definitely think it’s a good place to start. 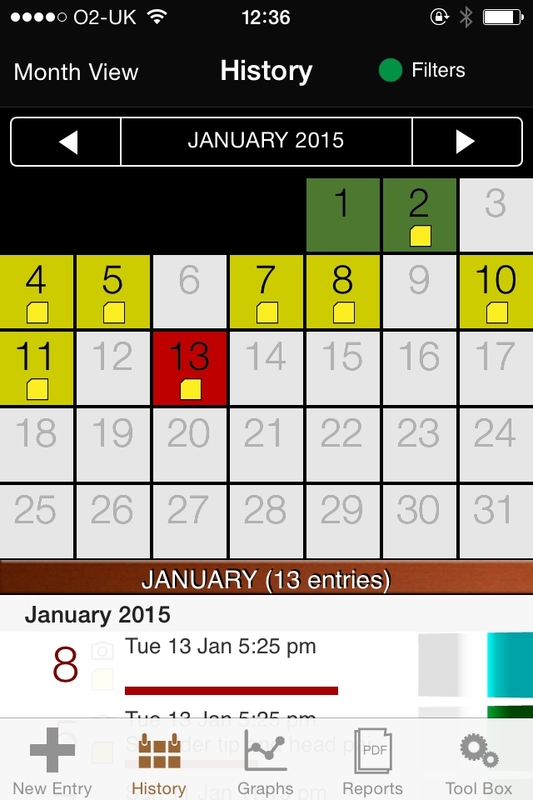 Also, I have started using the Catch My Pain phone app (for Android) to log my pain. This is also good because it can give your Doctor a visual graph view of how much pain you are in, instead of you just trying to tell them. Finally, even though I’ve had a relationship with my current Gynaecologist for about a year now, I always write down any notes or questions I want to ask her. Usually I walk into her clinic room and my brain just magically empties, so this is always useful. Thanks for this lovely and helpful message. I really like the idea of writing a summary and emailing it over in advance. Might give that one a go soon. Going to focus on writing really good aims and questions to take with me to my appointments too, and will report back on how it goes. Hope you are well, and do keep in touch. I think you are preparing well by giving as much detail as you can about your symptoms. My tip is to be as positive as you can (which is tough) and don’t search the internet too much if you can. I got diagnosed in early December – I am 34 and couldn’t conceive after 3+ years. Despite not discovering it until now and having very low AMH my GP was great to get me into a fabulous specialist quickly….just had my laparascopy today and am back home in bed, recovering. * never articulating my pain to my GP properly because I thought it was normal. I would say things like, “yes, my periods are painful but I survive”. I thought it was normal. In hindsight, I now realise lying on the floor in a disgustingly dirty public toilet in agony is not normal! This is why women need to be educated hey!! Hope you have a similar positive experience with your specialist. Thanks for the lovely message. I hope you are recovering well from your surgery and being pampered a bit! Those are really useful and encouraging points. I agree that it is really difficult to communicate the severity of your pain to your doctor- definitely a skill to learn. Glad it isn’t just me. It’s so annoying how I can spend weeks in pain, and then when I’m act the doctors I’m miraculously fine and then struggle to say how unwell I’ve been. Anyway, I will keep you all posted on how things go, and keep in touch about how you’re doing too.